This scroll was just completed today. It is a Sandan Hyougu which means three step scroll. This has a Gold leaf pattern Ichimonji along with a Cocoa colored Chumawashi cotton cloth and a Forest Green Ten and Chi. This picture was painted by Darlene Dihel a Sumi-e artist in the Seattle Washington area. It is a beautiful work. 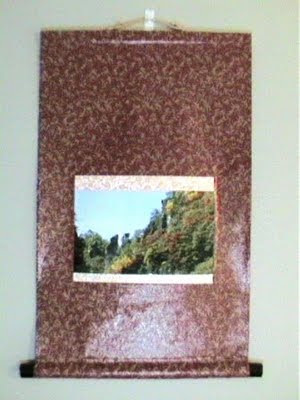 I used the Green cloth to complement the color of the pine in the picture and the brown to represent the Earth from which everything grows. If you would like to have your own artwork framed in this style, please contact Jonathan Maples at http://www.customjapanesecalligraphy.com/. The Fukuro Hyougu scroll is characterized by lines of cloth called Suji 筋in the Ten and Chi. The lines can run horizontal or vertical from just inside the Kan. The Suji are typically much smaller (less than 1 Bun 分 which equals about 3 millimeters). But in this scroll, a thicker, black 3 Bun Suji was used to help provide contrast with the light, pale blue cloth. 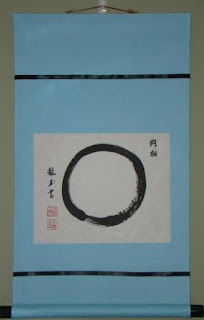 What I was trying to achieve was the Blue (In & Around the Enso), Black (Calligraphy Work), Blue (Cloth), Black (Suji), Blue (Cloth) and Black (Jikusaki). This provides a rounded overall feel of balance and coordination. If you have questions about working with us to develop your own personalized framed scroll, contact Jonathan Maples at 435-656-1870 view my website at http://www.customjapanesecalligraphy.com/ or e-mail to sales@CustomJapaneseCalligraphy.com . This microkakejiku measures 9 Inches by 3 inches. It is on a Copper cloth and is bordered with a white on gold flower design Ichimonji. The character is done in a Kaisho (Block Print) style. This character is 幸 Shiawase or Saiwai which means happiness. 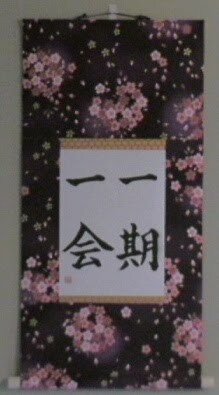 Other words associated with this character are 幸運 Kouun Good Fortune. This is also a common character used for the girl’s name Sachiko 幸子. This beautiful small scroll sells for only $9.95. For other inquires please contact sales@customjapanesecalligraphy.com. Haiku poetry is formed by a five/seven/five mora pattern. It typically must contain some mention of the season of the year. In this case, the deafening sound of the Cicaida emerging is an event that happens every year in the summer. In order to complement this poem, I used a leaf pattern of the cloth. 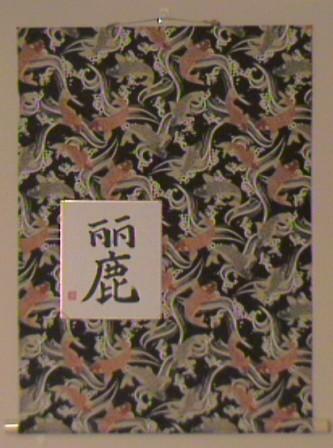 This scroll is in the Maru Hyougu style with the Ten, Chi and Hashira surrounding the work with the Ichimonji. I used two primary colors, the Red Kinran and Blue Kireji, to provide a strong contrast for the centerpiece of the scroll. The blue leaf cloth I have had for some time, and was looking for the correct time to use it. The Semi in this work standing on the leaf stem was a good match. This picture was drawn by Sumi-e artist Teiko Applebaum of Seattle. I have grown to love her style of painting which is both plain and straightforward. This is a scroll used to symbolize prosperity and long life. The 鶴 Tsuru, or crane in Japanese culture symbolizes long life and a good marriage. The 亀 Kame also symblizes longevity. The 松 Matsu is a tree long revered in Japan for it's evergreen nature. The term Omedetai is a phrase wishing one congratulations. I had a sumi picture of a pine branch from Teiko Applebaum. The picture seems upside down, but if you look close at the Hanko (stamp) it is realized that this is the correct framing. My wife mentioned to me the symbolism of these three and it was only natural that I take the cloth with the Crane and Turtle pattern and combine it with this picture of the pine. Red is a color associated with luch and good fortune in Japan. This was the reasoning behind my use of the Red Ichimonji and the Red Jikusaki on the scroll. This is a custom request. 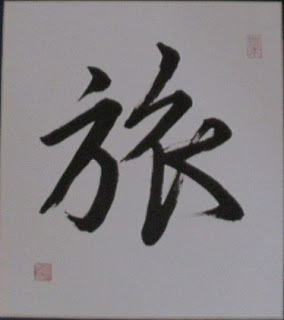 The character reads Gouki, with the first character Gou meaning firm or hard. Ki is the character that means feeling and spirit. Together these mean fortitude. There is a style of Karate called Goujuu-ryu which incorporates this same first character. This is written in the Kaisho, block print style. 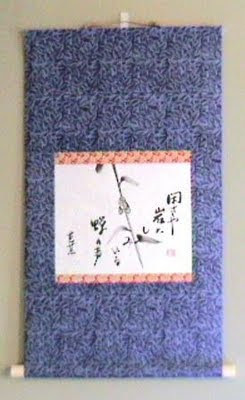 The scroll is on a navy cloth with a white ichimonji that has a large gold ivy pattern. The scroll is finished with a beautiful black plastic Jikusaki and gold Kakehimo. 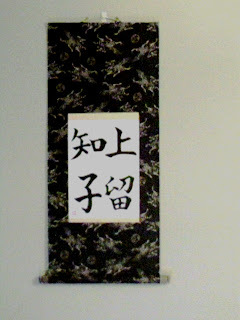 To design you own personalized scroll, please e-mail to sales@customjapanesecalligraphy.com. This is a custom yatsugiri scroll order. It was commissioned with an Art Blue cloth frame, a white background large flower pattern ichimonji, black jikusaki and a dark green kakehimo. The phrase written in the scroll is taken from the T.S. Eliot poem titled, "The Dry Salvages", which is the third poem of the Four Quartets. The poetry section referenced is 'Many gods and many voices'. We translated the meaning as 多の神多の声 (ooku no kami, ooku no koe). As following a traditional method of Japanese Calligraphy, only the Kanji have been used and the possessive particles No have been omitted. This is in a Semi-cursive writing style called Gyousho. This piece was written by shihan Ryugyoku Yamada. This scroll measures about 4.75 feet long and 11" wide. For questions on having an original scroll created specifically for you, contact sales@customjapanesecalligraphy.com. Not many of our customers order the Sousho full calligraphy style of kakejiku. Although typically unreadable without training, the creativity and individuality of the artist is evident in the brush stroke. Calligraphy student's spend painstaking hours of practice to learn to first conform their writing to specific standards. Only after mastering the ability to make perfect strokes in the Kaisho style are they then allowed to train on utilizing their creativity and expressing their individuality. This is the character for tiger 寅 Tora. This is the third character in the Chinese Zodiac. The more commonly used character for tiger in Japanese is 虎 which is also read as Tora. This is on a white and gold ichimonji surrounded by the Navy cloth. This is a small scroll with a postcard of Beppu in Oita Japan. Beppu is famous for it's onsen (natural hot springs). Although I have never been it is close by. There is a particular hot spring called Oni no Jikoku, 鬼の地獄 or Demon's Hell. Although the pictures are not clear, there are statues of two Oni, and the river in the upper right flows red. I think this is a good representation of Hell. In tribute to this imagery a cloth of Oni which was purchased in Japan this year was used to complement the scenes in the picture. The cloth is dark tan with light tan and blue Oni in the design. The bright orange and gold in the Ichimonji provides a stark transition between the picture and the cloth. This scroll has no jikusaki. It is small, less than 1 foot long and about 9 inches wide. Ren 練 is a character used in such words as Shiren Trial, Kunren Training, and Renshu Practice. 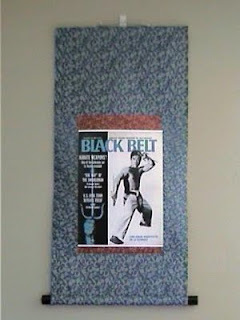 This was a scroll designed for a Martial Arts student in Hawaii. 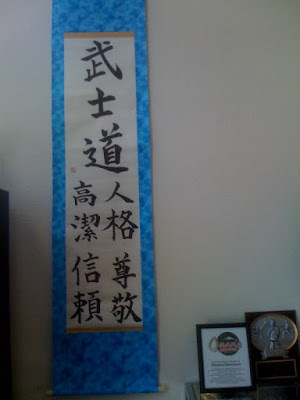 He wanted to hang this scroll to meditate on the Process of Growth in Martial Arts study through training, trials and practices. 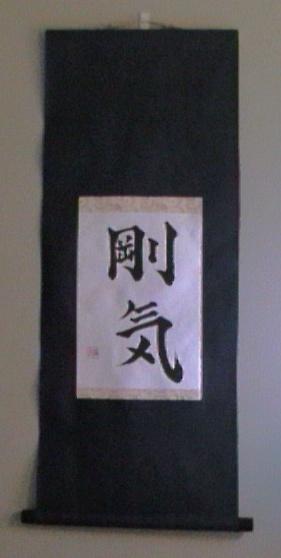 This is a Hanshi scroll done in the Kaisho (Block Print) style of writing. The tsuru crane provides a peaceful scene. The gold ichimonji highlights and accents the transition from the black to the white. For information on personalizing your own scroll, contact sales@customjapanesecalligraphy.com. 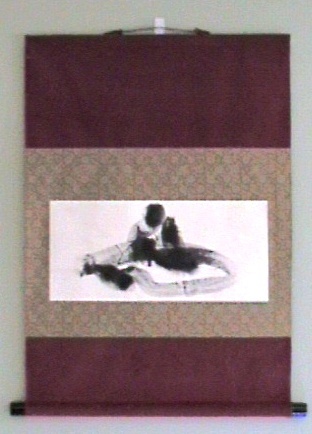 This scroll was created for a Dojo in New Mexico. The style of their developed Martial Art is called Koryuryu. Ko is the character of Tiger, Ryu is the character of Dragon and Ryu is the character for style or flow. 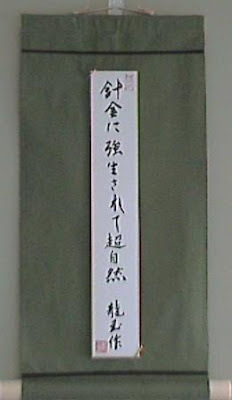 The scroll is complemented by a Gold Ichimonji and has additional writing of Grandmaster Bily written to the right hand side. Custom works are our specialty and it is easy to develop a one of a kind work of art for anything related to the martial arts. The following excerpt is taken from Wikipedia. Morihei Ueshiba (植芝 盛平 Ueshiba Morihei, December 14, 1883–April 26, 1969) was a famous martial artist and founder of the Japanese martial art of aikido. He is often referred to as Kaiso (開祖? ), meaning "founder", or Ōsensei, "Great Teacher". This is a small minikakejiku. With a green cloth background. The green cloth has gold stripes in a pattern. It is finished with a White with Green Kakehimo and white plastic jikusaki. If one would like a larger image framed, that type of work is possible. This scroll is for sale at $17.00 plus $3.50 shipping and handling. 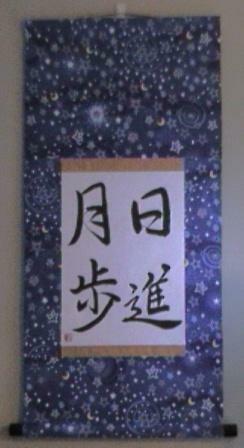 This giclee print was provided by Black Belt Magazine at a tournament in which Custom Japanese Calligraphy was a vendor. They requested a red background for the scroll. Fumio Demura is a noted teacher of karate, martial arts circuit demonstrator, and acted as the stunt double for Mr. Miyagi in the Karate Kid Movies. This is a two step scroll or Nidan Hyougu. The white background of the printer paper was used as the Chumawashi while a red cloth was used for the Ten and Chi. (Please see previous blogs for explanations of these terms, or visit to www.customjapanesecalligraphy.com. 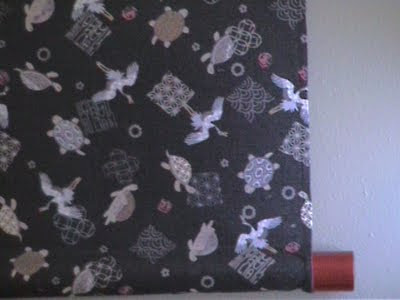 A black jikusaki complements the work along with the Red Kakehimo which is similar to the cloth. We hope the office at Black Belt Magazine loves this work as much as I enjoyed making it for them. This scroll shows Master Jigoro Kano to the right, locked in combat with another student. I am not versed in the detailed history of Judo, and so do not know the person pictured to the left. Kanō Jigorō (嘉納 治五郎?, 28 October 1860 – 4 May 1938) was the founder of judo. Judo was the first Japanese martial art to gain widespread international recognition, and the first to become an official Olympic sport. Pedagogical innovations attributed to Kanō include the use of black and white belts, and the introduction of dan ranking to show the relative ranking between members of a martial art style. Well-known mottoes attributed to Kanō include "Maximum Efficiency with Minimum Effort" and "Mutual Welfare and Benefit." Judo is the way of the highest or most efficient use of both physical and mental energy. Through training in the attack and defence techniques of judo, the practitioner nurtures their physical and mental strength, and gradually embodies the essence of the Way of Judo. Thus, the ultimate objective of Judo discipline is to be utilized as a means to self-perfection, and thenceforth to make a positive contribution to society. I felt the dark Earth tone would complement the picture. This is accented with the white and gold ichimonji. This is a picture of Mt. Takachiho, in Miyazaki Prefecture Japan. The Ichimonji was done with a White and Gold cloth while the Ten/Chi/Hashira were done in the Navy Cloth. The dark blue of the cloth really brings out the color of the flowers in the picture. This simple scroll is available for purchase at $12.50. Shipping & Handling and Taxes are not included. This is a Two-Step Scroll called a 二段表具 Nidan Hyougu. Ni stands for the number two and Dan stands for step or process. This style is accomplished by setting a 中廻 Chumawashi around the work along with the additional Ten and Chi. It differs from the Sandan or Three Step scroll style in that there is no Ichimonji attached to the work. This is a scroll that depicts a symbol of the Buddha, or 仏様 Hotokesama. It was created by Ben Strawn, an artist in Salida, Colorado. The artist painted on a strip of canvas. 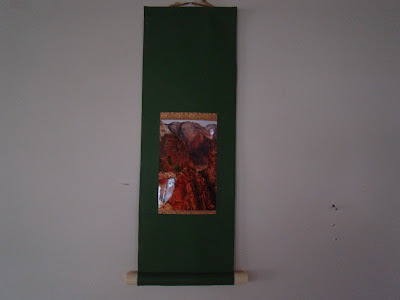 I put the Hada Urauchi (first layer of paper) on the cloth Silk 中廻 Chumawashi, which is the green cloth in the scroll. The Ten & Chi were requested to be an earth tone color. I had never tried to use corduroy fabric in a scroll before, and it actually turned out to be quite complementary with the heaviness of the canvas which with the work is placed. The work is complemented with black lacquered wood Jikusaki and the red color in the Kakehimo blends simply with the red of the corduroy cloth. The scroll at the left is in a style called Sandan Hyougu. Dan is the character in step, or stairs. (Dankai 段階 or Kaidan 階段). The reason for this is that it utilizes three distinct cloths. 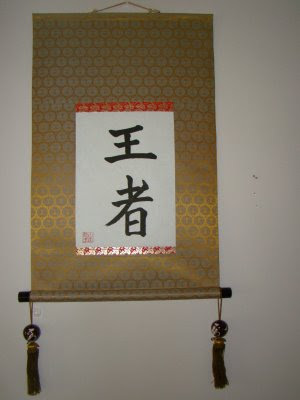 After the Ichimonji (red and gold top and bottom border) are attached to the work, then the Chumawashi with distinct Hashira, Ten (Heaven) and Chi (Earth) are attached to the scroll. 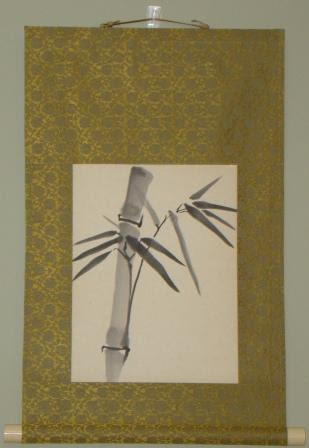 The Chumawashi in this example is a light green/gold ivy pattern silk. The last layer is to insert the final Ten and Chi , which is the solid red cloth of this scroll. The Three layers or phases are then completed by creating the Mimiori and putting the final layer of Urauchi to complete the scroll. The look and feel of this style of scroll is a little more flashy than the maru hyougu style found on most of the other posts. Another scroll in the Sandan Hyougu example will follow later this week. Thanks are extended to Ben Strawn, a Salida, Colorado artist for providing this block print for mounting. Ru (The character below the Ue) Means to live or exist. The direct translation for this was "to know the child(ren) lives in heaven". As she was writing this, Yoshimi felt inspired to think about the Savior, Jesus Christ. Hence, can be either your own children or the One Child. The writing was done in Block Print Japanese Calligraphy called Kaisho. Please see other scroll pictures in the blog to compare to other writing styles. The black and the tan in the cloth was perfectly accented by the antique, wood jikusaki (end caps) and the tan and cream fuchin (Hanging ceramics with tassels). The scroll size was about 3 feet by 1.5 feet and one of the most beautiful works to date. Kachofugetsu is a four character idomatic expression with the characters Flower, Bird, Wind and Moon, in that order. These characters symbolize the beauty of nature and the aspects of life. This is written in a Semicursive style called Gyousho by Ryugyoku. The scroll size is about 4.5 feet long by 1 foot wide. The cloth chosen for this was a goldenrod, to represent the light of the sun which provides warmth and life. The black jikusaki (end caps) represent the richness and soil of the earth. This scroll was commissioned by a customer from the Salida Art Festival. It has a beautiful white on gold Ichimonji to provide a powerful transition for the black cloth. The jikusaki has a specialty gold pattern which matchs nicely to the overall feel of the scroll. To read about the meaning of Ensō it is recommended to go the the link in the word provided by Wikipedia. 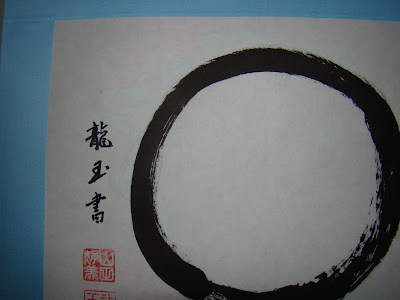 (円相) is a Japanese word meaning "circle" and a concept strongly associated with Zen. Ensō is one of the most common subjects of Japanese calligraphy even though it is a symbol and not a character. It symbolizes enlightenment, strength, elegance, the Universe, and the void; it can also symbolize the Japanese aesthetic itself. As an "expression of the moment" it is often considered a form of minimalist expressionist art. This is a mini-kakejiku with a small diameter wooden jikubou. It was commissioned and made for Robert Loewe, a traditional tapestry weaver, as an order from the Salida Riverwalk Arts Festival. 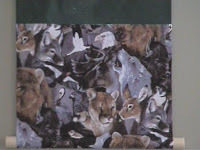 At first glance, it would seem contradictory to use a spring time cherry blossom purple cloth with a winter scene. However, as I thought about it, this is how I decided to present this to the customer. It is often in our lives that the darkest, coldest trials are placed before the blessings and renewals of spring. This may be why the cherry blossom viewing or hanami, as it is called in Japanese, is a cherished tradition to enjoy the rebirth of life. So as inspiration, when all things seem to be conspiring against you and the trial seems unbearable, remember that a blessed Spring is just around the corner. This scroll was completed on June 15, 2009. The dimensions of the scroll are 17.32 Inches wide by 26.18 inches long. I will also explain how the measurements are traditionally reported. The units of measure from smallest to largest are rin, bun 分, sun 寸and shaku 尺. There are smaller and larger units of measure, but I have never used them in making a scroll. This scroll is written in Kaisho (block print) style by Ryugyoku Yamada. The character reads Ooja, and can translate as champion or ruler. The top character is that used for king. As always, there are three concepts to consider when creating a scroll. 1. Where it will hang. 2. The contents of the art piece and 3. The artist. 1. Where it will hang. This is on a gold/light brown silk. These colors correspond to the Northeast or Southwest areas of the house according to some Feng Shui schools. 2. The golden silk was chosen particularly for this to provide the image of a champion receiving a gold trophy or belt for the victory achieved. 3. Ryugyoku, although female, has a very masculine style of writing due to the influences of her teacher who is male. The gold seemed to match the strength of the message of this writing. 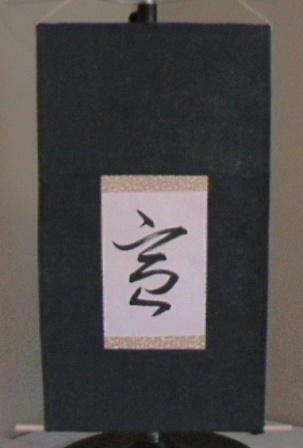 For more information or to ask questions about price of this scroll please e-mail to info@customjapanesecalligraphy.com. It is a common misperception that kakejiku or wall scrolls are only used for Asian art styles such as Shodo, Japanese or Chinese calligraphy or Sumie. However, one can see that this framing style can beautifully transform a photograph by utilizing cloth colors which both complement and enhance the artists vision. Now the concepts used to frame the photograph will be detailed. This photograph was taken by David J. West. As always there are three primary ideals to think about as the Hyousoushi, or framer, when constructing the frame in your mind. These are 1. Where the work will hang; 2. The contents of the work to be framed; 3. The artist and his style, vision or work studio. There was no preset place to which this work would hang, as this was not a commissioned work. Primarily, concept two dominated the reasoning of how this was framed. However, applying the principles of Feng Shui, the green frame and the reddish brown would work well to hang in the East or Southeast areas of a home. These compass points correlate with health/family and money/abundance respectively. There is a spattering of green from the flora of the area within this photograph, and so to bring out that desert plant feel the green solid cloth was used. To provide a soft transition, a dull gold with a very pale green for the Ichimonji, (or cloth with Gold Filament) was used to provide a continuous transition between the stark Red/Brown and the green of the cloth. To my untrained eye, David's works tend to use rich textures without using light to overpower the end result. In other words, I felt his works were a little darker than most Southern Utah landscape photographers. Therefore I chose a shade of green that was not as dark as the flora of the picture to complement with a little light, without taking away from the artists original intention. The Sumie was created by Ren Adams and is an original work. I will explain the theory behind how the scroll was framed. There are three primary principles involved when creating a scroll. Involves where the scroll will hang. Some of my works are commissioned, but this was not and hence I used Feng Shui Principles of the Ba-Gua to guide how I wanted it to be placed. The color black is associated with the North element of Water, which deals with Career and Path. The Red symbols within the cloth are associated with the South element of Fire, which deals with individual Fame and Repuation. Therefore my hope is that hanging this piece in the North or South area of your home would help career and individual reputation. The background of the Ruyi Scepter is explained in detail above. It was used by royalty. For that reason I tried to use the Gold ichimonji with the green to symbolize the wealth and austerity of a royal court, while providing a startk contrast between the black cloth and the black scepter. I have seen this artists studio and it is a very creative workplace. I used a non-solid pattern to reflect the feelings emoted when meeting Ren in Albuquerque, New Mexico. As a hyousoushi, I try to think about the artists personality, their vision within the work, the desired feeling to be emoted and where the work was created. These principles help me to decide how to choose the cloth and design of the scroll. 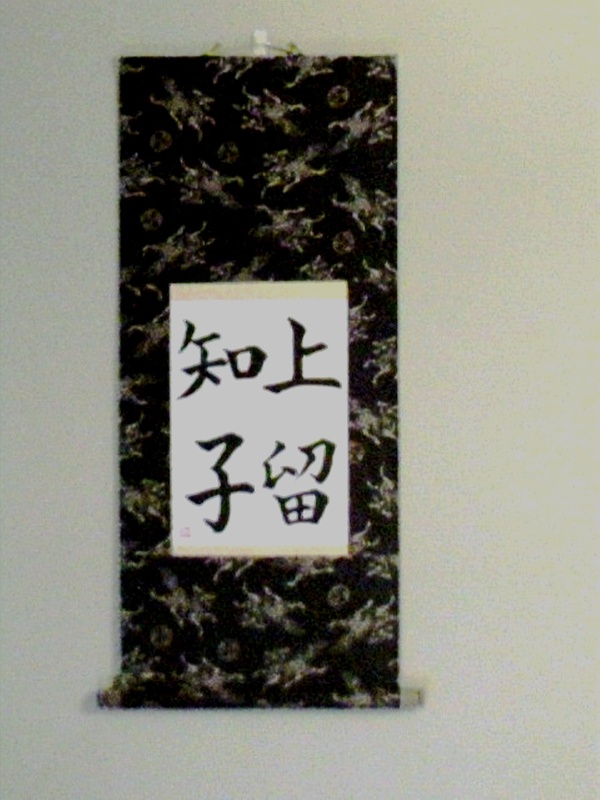 This is a scroll with the 7 Virtues of the Bushido written in a semi-cursive style by Ryugyoku. The scroll cloth is a cotton with the figure of a dragon in Black and Red. 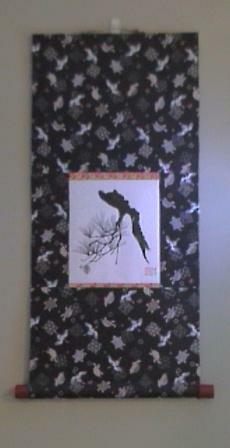 The paper size is Yatsugiri and the scroll is roughly 5.5 Feet long and 1 Foot wide. Some translations differ in that they utilize Chuugi or other two character words for the principles. I prefer the more esoteric one character principles to provide a less strict interpretation of the meaning of the principle.